As ‘Scandi Cool’ reaches new heights across the UK, Nordic cuisine has never been more trendy, so staff at the Nordic Bakery on Neal Street in Covent Garden, the company’s fourth store, have been rushed of their feet since they opened in December. Located amongst the crowded rush of one of the city’s most popular shopping destinations (around thirty two million people visit Seven Dials every year) the bakery aims to be an oasis of calm and an ideal spot for fika (the Swedish concept of meeting up for a coffee and chat). The moment you come through the door you are hit by just how much care has been taken to ensure your surroundings emit complete tranquillity. Moss green tiles, reminiscent of Scandinavia’s pine forests, have been combined with sky-grey walls and an expansive natural pine wall even covers one side of the café to create a fully biophillic feel embraced by designers worldwide as a means of reducing stress. 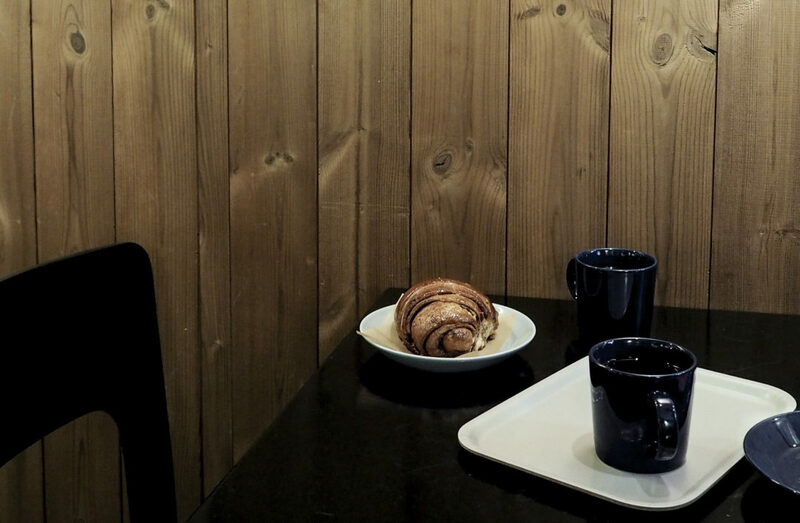 To reaffirm their calming surroundings, silence in the Nordic Bakery is golden. Studies conducted by the Finnish Tourist Board’s Silence Please campaign has found that two minutes of silence a day is more relaxing than listening to music, and that silence not only helps the brain to grow and replenish cells, but also allows for individual reflection and gives time to consider profound thoughts in an imaginative way. By injecting the findings of these Nordic studies into their Nordic corner of Covent Garden, the bakery’s staff aim to give both regulars and passers-by a refuge from the torrent of London’s constant rush. But far from feeling sterilised, the silence and cleanliness of the café is hip and cool- the kind of place you might expect to see Borgen’s Katrine Fønsmark tapping out her latest article. Whether through fika, foraging or baking as a family, food is part of the social fabric of life in the Nordic countries, and the Nordic Bakery will provide you with plenty of it throughout the day: from oven pancakes and berries in the early morning, to salads, sandwiches and creamy potato Karelian pies at lunch time, to Norwegian skolebollar, lingonberry buns and the store’s renowned cinnamon buns at tea. Next time you need a break from relentless rounds of shopping, bear in mind that the Nordic Bakery is waiting round the corner to calm you down with a strong coffee, a warm bun and a friendly smile.